"Not an old rag, but a flag, and I'll buy it!" 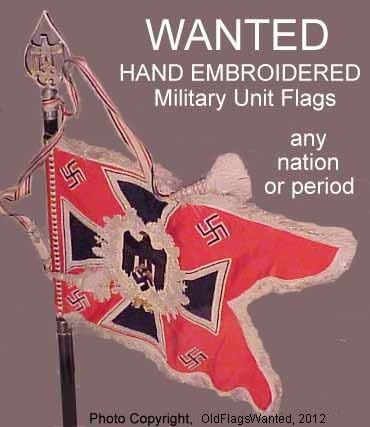 Military unit flags (embroidered & depot made)...Guidons (silk or wool bunting)...Fragment unit flag pieces (documented)...Battle streamers...Engraved pole rings...Cords & tassels (military issue only)...Old flag books...American Military Issue Parade Size Stars & Stripes Flags...Ship flags (Navy Yard made and dated)... Flag cover bags (military issue only)...Pole tops (military spears only)... Unit flag photos (clear flat display views)...Troop and parade photos (showing unit flags)....Military unit flag stands & carry harness (old & unusual only)... Prints (of unit flags in combat) ...Plates of flags (from old dictionaries, etc. )...Will trade flag dating and identification services for flags....Referrals paid if flags purchased from others via referral!!! What do you have??????? ?